I am obsessed with the beach theme lately as winter lingers on and on here. Yesterday we had yet another 7 inches of snow. STOP I say. So I need to surround myself with the peaceful tranquility of the ocean. I grabbed the FabScraps Beachcomber collection for this. This project has two looks - one with the 8in x 8in canvas behind it and one without. 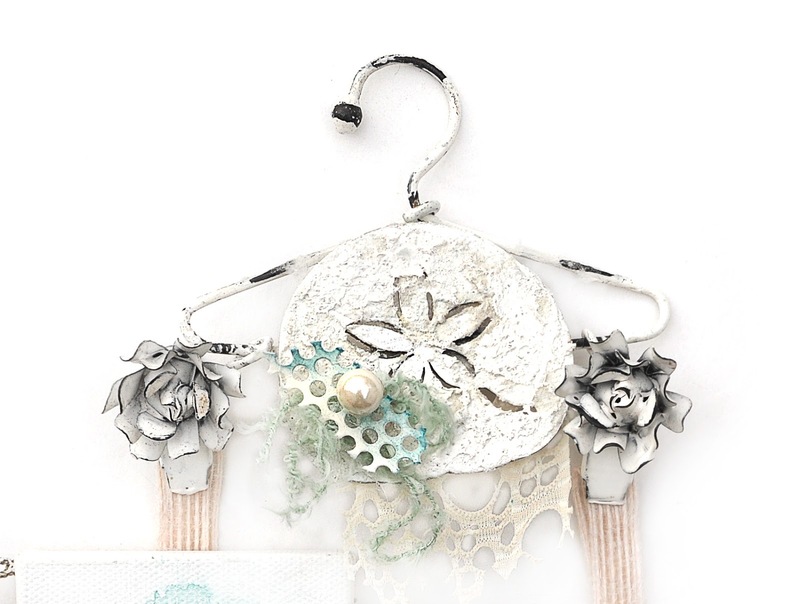 Just pop off the pretty decorative hanger and it hangs alone on a wall or window. 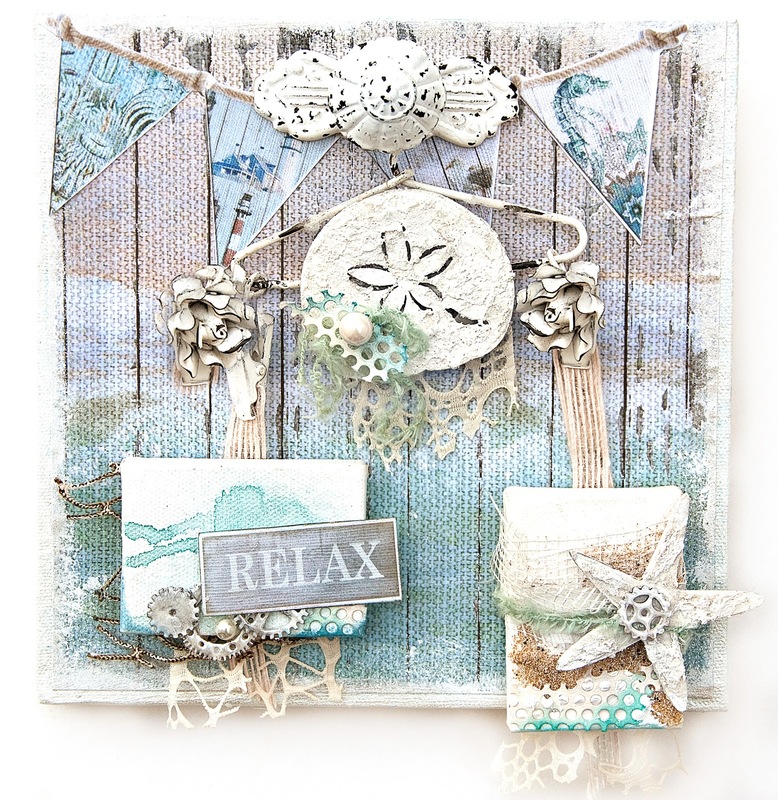 Below is the tiny mini frame decorated with elements from the Mixed Art add-on and from FabScraps Beachcomber collection. You can see shots of it on the background and off. 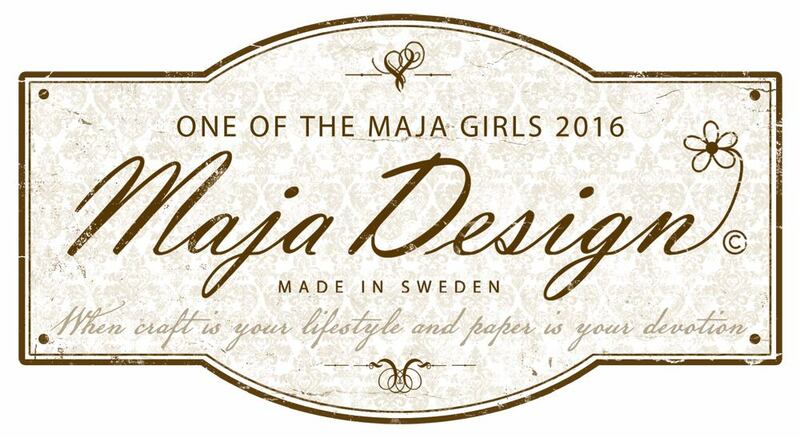 I have also attached step by step instructions of the project at the bottom of this post. The metal gears have been covered in white frosty ink and heat dried. The gorgeous sanddollar chipboard piece from FabScraps DC64013 has been painted white, and covered in Shimmerz Texturez, Tidy Widy. This is wonderful texture paste. The star fish is also from FabScraps chipboard DC64013 and has been painted white and covered in Tidy Widy texture paste. I have also added strips of mesh, Viva Sand Texture paste, dry wall tape, and fibers. Here is the complete project without the 8x8 canvas background. Grab up the Mixed Art kit before it's gone. 2. 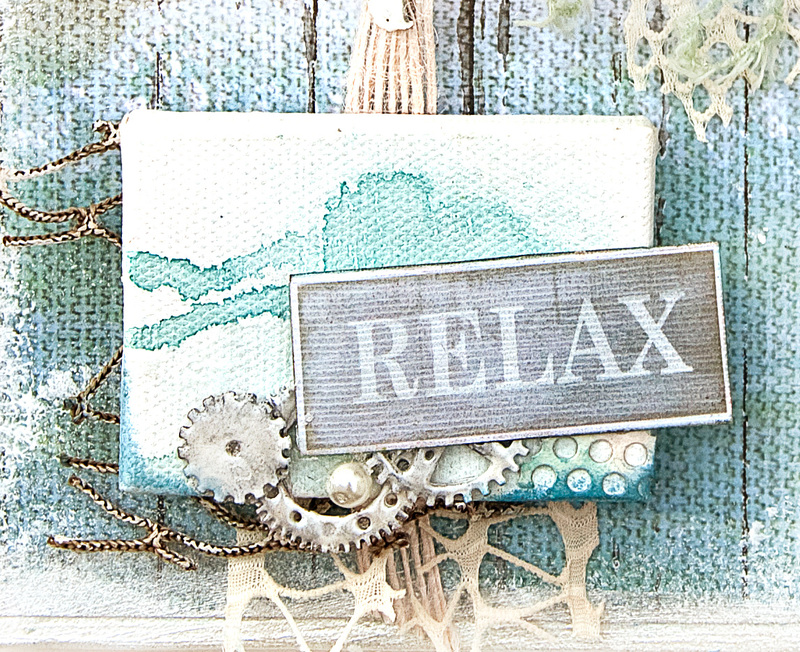 Cut a square of FabScraps Beachcomber Splashes 2 C64004 paper to cover the front of your canvas – leave ¼ in around the edges for canvas to show. Glue to canvas – or adhere using a gel medium. Gel medium will not ripple the paper. 3. 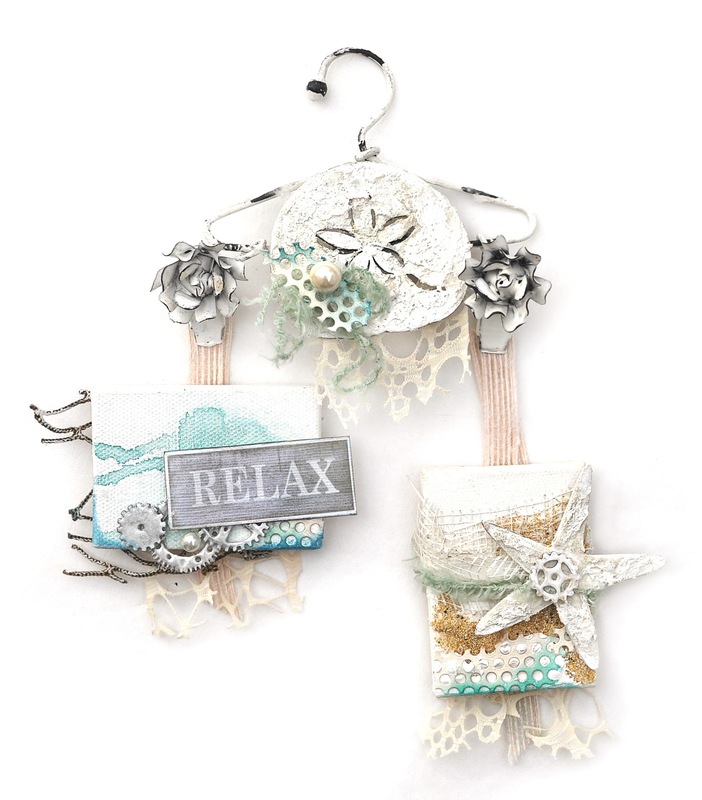 Dab gesso or thin white acrylic paint around edges of paper and canvas for a beachy weathered effect. 4. Drill a hole in the top of the canvas at the wood frame and attach the decorative door knob. Make sure decorative metal hanger fits over door knob. 6. 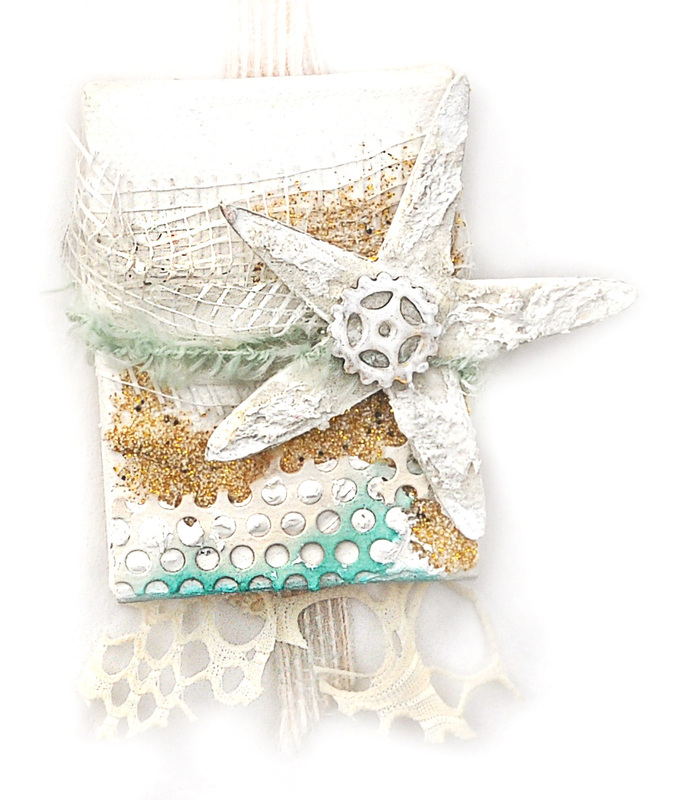 FabScraps Beachcomber Collection chipboard – Shells and Starfish DC64013 - Paint a sand dollar and a star fish with white gesso or paint. Cover with a texture medium like molding paste or ceramic paste. You can even mix sand to your molding paste to create beachy texture. 7. Add a decorative center to the starfish. Set aside. 8. Glue Sand dollar to the metal hangar. Add some web weave on the back and a fiber bow. 9. Decorate the bow with punched paper tape and pearls or beads. 11. 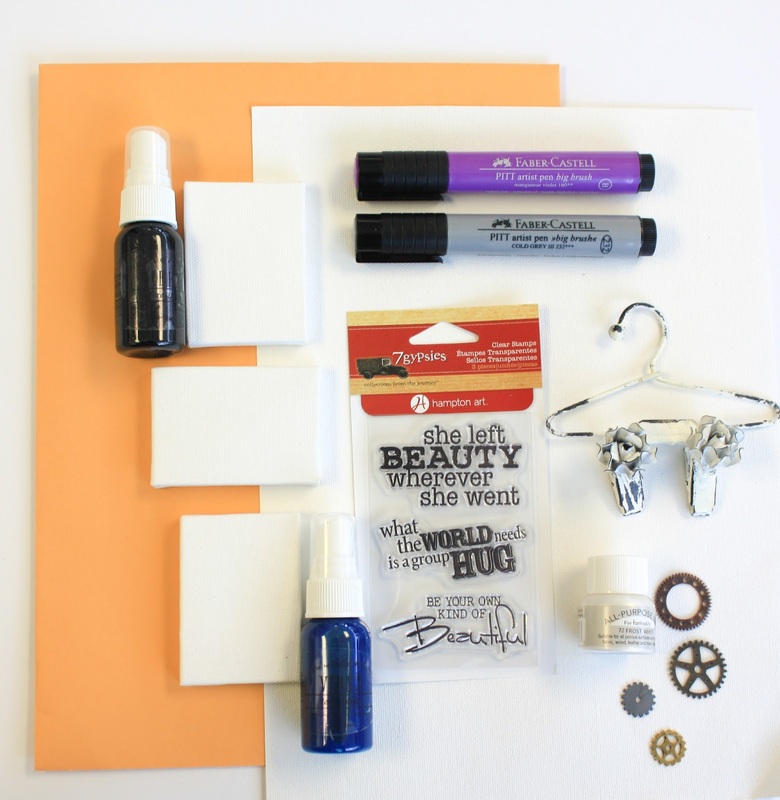 To decorate the mini canvas – here are the products I used but the options are limitless. 12. Small canvas #1 – I used layers of molding paste, sand texture, mesh, fibers, punched paper tape that had been inked. I glued the chipboard starfish to the canvas, then tied fiber around it to further hold in place. Add trim to the bottom – I used Web weave. 14. 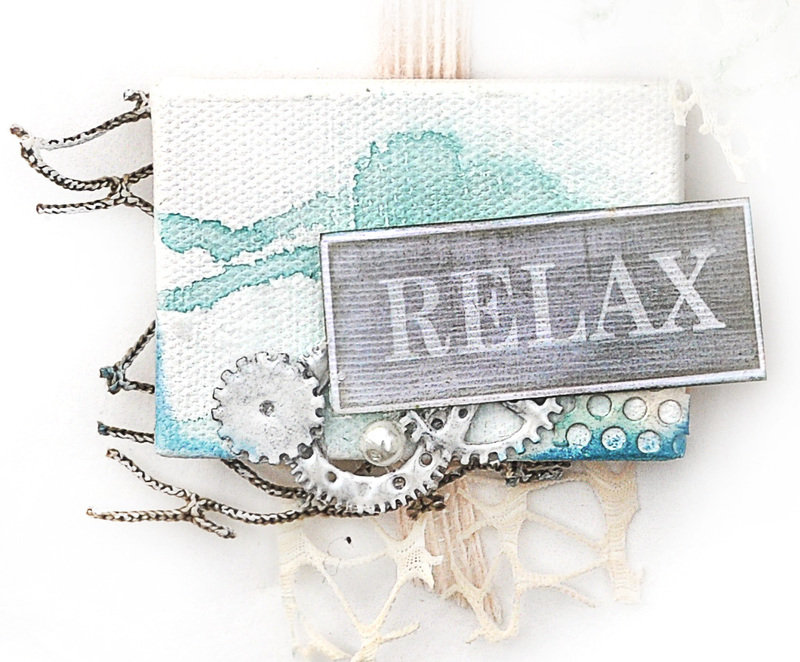 Using stickers from FabScraps Beachcomber Collection Stickers ST64001, remove the “Relax” sticker and mount on white cardstock to make it durable and brighter since the stickers are transparent. Glue to the canvas. 15. Add small amount of fishing net to the back and dab the net with gesso for a softer weathered look. Finish with web weave glued to the bottom of the canvas. 17. Glue some ribbon to the mini canvas’ and clip to the hanger to let hang. 18. 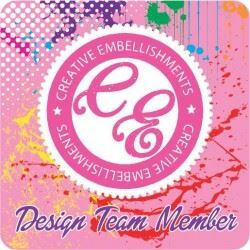 Using stickers from FabScraps Beachcomber Collection Stickers ST64001, remove the banner stickers and mount on white cardstock to make it durable and brighter since the stickers are transparent. Glue to the top of the canvas.